Your journey begins as you wind your way through the city's streets while our local guide points out the highlights and folklore that has made Juneau famous. After a short 20 minute ride out of town, you will experience nature at its best by visiting famed Mendenhall Glacier. Come face to face with this mammoth "river of ice" at the Visitor's Center or take a nature walk on the maintained trail. This excursion also includes a countryside journey near Auke Lake and Chapel before returning back the city. In season, a stop may also be made to witness the spectacular sight of salmon as they head upstream to spawn and die, completing the cycle of life. In late August or September there is a chance to see a bear following the salmon! And as always there is the chance to catch sight of an eagle. A must for every cruise visitor! Don't forget your camera! 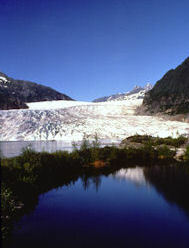 Guests spend approximately 45 minutes at Mendenhall Glacier.